Interior Cabinet Secretary Fred Matiang’i has ordered the immediate closure of all bars in Kiambu county. The directive is part of the ongoing crackdown on illicit brews and drugs across the country that Matiang’i launched yesterday. Speaking in Makwa village Gatundu North Constituency which is notorious for illicit liquor brewing, Matiang’i said the directive will give Kiambu bar owners a chance to apply for licenses afresh and county government the opportunity to vet and issue licenses to those who will meet the set conditions as stipulated in the recently enacted Kiambu County Alcoholic Drinks Control Act. The CS singled out Kiambu as one of the most affected counties noting that it has more bars than schools. “Kiambu has a mysterious history with illicit brews. It’s the only county with more bars than all the primary and secondary schools put together,” said the CS. The county has 1,226 public primary and secondary schools while there are 3,062 liquor outlets across the region. “We must sort this out once and for all. Illicit liquor has become the worst hiccup in the government’s Big Four agendas for the country,” the CS said. The CS, however, faulted the judiciary over claims of helping bar owners operate using court orders. “Let us work together. We are one country. I urge the judiciary to be part of the solution not part of the problem. The challenges we are facing are our administrators battling court orders every day,” he said. Matiang’i also warned county leaders against taking bribes that facilitate the scourge. “We will act on every chief hindering the fight against illicit brews. We are doing our best to support chiefs to deliver services to the people,” he said. 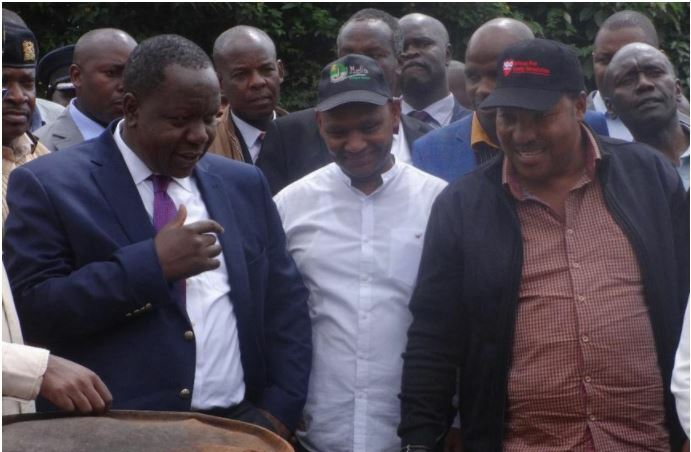 The CS said the crackdown will be immediately rolled out in other counties and urged other governors to follow in Governor Waititu’s footsteps. Matinag’i was accompanied by PS Interior Karanja Kibicho, Inspector General of Police Joseph Boinnet, Thika MP Patrick Wainaina, Kiambu MP Gathoni Wamuchomba, Gatundu South MP Moses Kuria among others.